On Friday, police officers responded to a disturbance at a pool party in McKinney, Texas with a grotesque and excessive use of force. By Sunday, the event had become the latest southern outrage to boil the collective blood of the Internet. The altercation, involving an overzealous police officer, a barrel roll, and several unarmed black teenagers, stemmed from an initial dispute over who should be allowed access to a privately-owned and managed swimming pool. Several residents claim that black teenagers showed up uninvited to a private party and attempted to scale fences when security guards turned them away. The hosts of the party, two black teenage girls, say that all the teens were invited and that antagonistic white neighbors started the trouble with a barrage of racial slurs. Whatever the precipitating factors, one police officer saw fit to draw his state-issued firearm when unarmed black youths objected to his use of unwarranted force against a 14-year-old girl. The McKinney case prompts several pressing questions regarding private discrimination and the freedom of association. Chief among them, as a recent article in The Atlantic helpfully illuminated, is what a society that purports to be free should do in the face of racial discrimination. Swimming pools, which mingle notions of communal and intimate space, have long been the locus of racial animosity and fears of miscegenation. When Strom Thurmond inveighed against legal desegregation in his failed 1948 bid for the presidency, swimming pools were second on the list of places white southerners would not allow their black neighbors to infiltrate. As public pools were forced to integrate, unreconstructed bigots retreated behind the protections afforded private actors to keep undesired classes away from their amenities. Parallels can be found in the history of school desegregation. In the aftermath of Brown v. Board, southern politicians engaged in massive resistance of federal efforts to integrate schools. In some cases officials refused to open integrated public schools, leaving students to the private market — with the implicit assumption that the market would better reflect their racist sensibilities. I believe strongly that the color of a man’s skin or the religion of his parents is, by itself, no reason to treat him differently; that a man should be judged by what he is and what he does and not by these external characteristics. I deplore what seem to me the prejudice and narrowness of outlook of those whose tastes differ from mine in this respect and I think less of them for it. But in a society based on free discussion, the appropriate recourse is for me to seek to persuade them that their tastes are bad and that they should change their views and their behavior, not to use coercive power to enforce my tastes and my attitudes on others. Many subsequent thinkers have used Friedman’s reasoning to argue that the solution to racial discrimination is to allow actors in the private market to punish firms that discriminate by denying them business or taking advantage of the best talent. Others go further, suggesting that Jim Crow would have died a natural death without federal intervention. Both these assertions present ahistorical abstractions of the reality of power and privilege in our society. The separation between private initiative and government coercion is imagined; actions within both realms can increase or diminish individual liberty. Moreover, private and government actors can act in concert, or at behest of the same interests. The diminishing history of public swimming pools underlines this point. Public pools slowly lost funding and attention after white residents abandoned them for private options in the wake of integration. Ownership and governance of private community pools were vested in homeowners associations rather than public committees. Confronted with the demand to integrate public facilities, a large number of citizens decided to pay for private options and starve public ones. Minority residents contending with inadequate public facilities before desegregation continued to face the same problem in integration’s wake. This same pattern can be found across the board, from housing and education to transportation and zoning. By stringently upholding the right of private actors to associate freely, many libertarians ignore the real cost in individual liberty for the marginalized, who are essentially shut out of mainstream society. Worse, it betrays an inability by some to empathize with the targets of exclusion rather than those who wish to discriminate. Ultimately, the failure is one of imagination; libertarians should anticipate that the powerful might use their economic privilege just as readily to achieve their aims as they would their political prerogatives. In fact, history suggests that the more local the exercise of power, the stronger the connection between private bigotry, economic exclusion and public policy. The libertarian panacea of smaller government is a poor solution, given the record. Which brings us back to the case in McKinney, a town that was recently forced to settle a housing discrimination lawsuit. The confrontation with police allegedly began with white adults suggesting that black partygoers to go back to their “Section-8 housing,” a reference to publicly-subsidized housing in the area. The taunt underlines the association of public goods with minority poverty – a connotation facilitated by the steady retreat of the majority to private options. 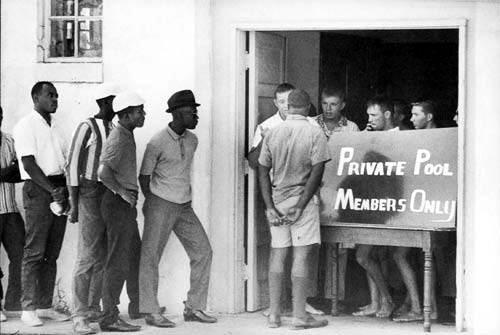 The episode should prompt libertarians to reconsider their total devotion to the principle of free association in favor of recognizing the consequences of private discrimination.